This final volume of the tragedies of Aeschylus relates the historic defeat and dissolution of the Persian Empire on the heels of Xerxes disastrous campaign to subdue Greece, the struggle between the two sons of Oedipus for the throne of Thebes, the story of fifty daughters who seek asylum from their uncle, the king of Egypt, because of his demand that they marry his sons, and the well-known tale of the proud and unrepentant Prometheus, who is chained to a massive rock for revealing fire and hope to humankind. Praise for the Penn Greek Drama Series: "A boon for classicists and general readers alike. For the reader who comes to tragedy for the first time, these translations are eminently 'accessible, ' and consummately American in tone and feeling. For the classicist, these versions constitute an ambitious reinterpretation of traditional masterpieces; after 2,500 years, the poetry of Euripides and Aeschylus has found a new voice--in fact, ten of them." --"Boston Book Review"
"Directness, vivid imagery, and rhetorical music prevail." --"San Francisco Chronicle"
"A boon for classicists and general readers alike. For the reader who comes to tragedy for the first time, these translations are eminently 'accessible, ' and consummately American in tone and feeling. 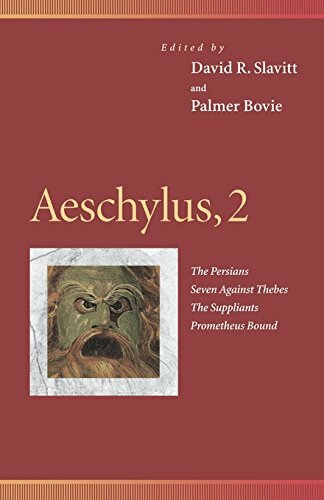 For the classicist, these versions constitute an ambitious reinterpretation of traditional masterpieces; after 2,500 years, the poetry of Euripides and Aeschylus has found a new voice--in fact, ten of them." --"Boston Book Review"
"A boon for classicists and general readers alike. For the reader who comes to tragedy for the first time, these translations are eminently 'accessible, ' and consummately American in tone and feeling. For the classicist, these versions constitute an ambitious reinterpretation of traditional masterpieces; after 2,500 years, the poetry of Euripides and Aeschylus has found a new voice in fact, ten of them." "Boston Book Review""
"Directness, vivid imagery, and rhetorical music prevail." "San Francisco Chronicle""